Gabriel Diallo was scrolling through the photos on his phone when he reached one that sent shivers through his body. Diallo and fellow Canadians Liam Draxl and Alexandre Leblanc had all just committed to play for Kentucky. Choosing the same college was merely a coincidence for the 2019 recruits. Despite their shared nationality, they didn’t conspire to play for the same program. They all explored other options, and individually decided they liked Kentucky the best. The three had been teammates once before on Canada’s Under-12 national team. They made a trip to New York in 2014 to play against a team of Americans. During a tour of the U.S. Open grounds in Flushing Meadows, the eight young Canadians gathered for a group photo on the court. Standing behind them smiling for the camera was their coach, Bruno Agostinelli. A former All-American at Kentucky, Agostinelli died tragically in a motorcycle accident in in Toronto in 2016 at the age of 28. He left behind a wife and two-week old son. Agostinelli had mentioned he played for Kentucky, but Diallo, Draxl and Leblanc don’t remember him going into great detail. They had nearly forgotten their shared connection until Diallo discovered the picture on his phone. A little divine intervention is the first thing Kentucky head coach Cedric Kauffman thought when his new recruits sent him the photo. He didn’t know it existed, and was overcome with emotion when he saw Agostinelli with the group. Kauffman was an assistant at Kentucky when Agostinelli starred for the Wildcats. Agostinelli was one of the best players in program history, recording more than 100 wins and ranking as high as No. 4 in the country in singles. 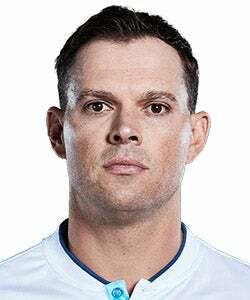 He represented Canada in the Davis Cup, and became a national junior coach for Tennis Canada once his career ended. He wanted to help young players earn the same opportunities he was afforded.